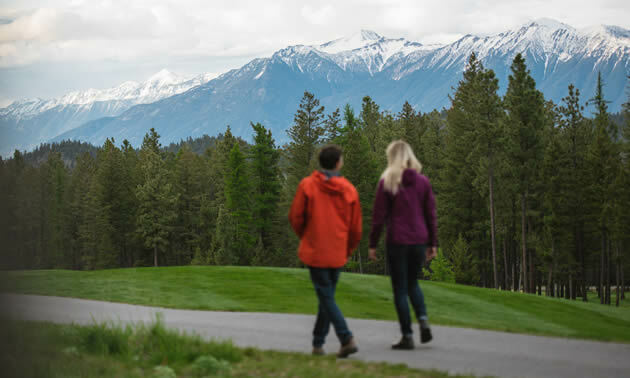 The Woodlands development overlooks Wildstone Golf Course and the magnificent Rocky Mountains. — Photo courtesy Story & Co. The elegant Royal Alexandra Hall in Cranbrook was alive with chatter, music and murmurs of appreciation for the food on offer during The Woodlands at Wildstone grand opening reception on May 17. The Woodlands is a 125-unit residential development situated at the Wildstone Golf Course. Development partners are Patricia Pollitt and Gary Pottage of Red Deer, Alberta, and Clint Cawsey of Canmore, Alberta. Remarks from Cranbrook’s mayor, Lee Pratt, its CAO, David Kim, and Kimberley’s mayor, Don McCormick, opened the event. All three expressed optimism about the importance and impact of a new residential development in the area, citing the employment opportunities during the construction process and the benefits of increased housing options. Pollitt, an early investor in Wildstone, recently suggested to Pottage and Cawsey that they look at the Woodlands project with an eye to investment. They liked the look and feel of Cranbrook and decided to invest in the development. The developers complimented the progressive mind-set demonstrated by the administrations of Cranbrook and Kimberley in establishing the Cranbrook-Kimberley Development Initiative. Cawsey thinks the initiative is an economic development model that makes good sense, and that it will have an ongoing positive outcome over time. The grand opening event was co-ordinated by Brook PR and exquisitely catered by Alicia Bodaly of Gathering Company in Kimberley. Music was provided by guitarist Don Glasrud. Guests were invited to view The Woodlands site after the grand opening reception via shuttle service provided by Tod Caton of Simply Kimberley. Sales of the housing units are open to any Realtor who wishes to be involved.